Karatavuk, still awaiting a response from the new pup, glanced at Aeria when she spoke, and smiled. "You'll find that out yourself." He promised, "Mine is control over the currents within the winds. Nothing major." In all honesty, however, Karatavuk would be lost without his control. He bent the currents to help him fly in harsh conditions, or in close calls while falling. If he didn't have the control, he would have died dozens of times over. He looked at the small pup and wondered himself of what her mutations may be. "You'll find that out yourself. Mine is control over the currents within the winds. Nothing major." "I don't want to control winds. Then I'd be copying, and that would be silly if all Ales wolves had the same talents." The youngster noted, "Next question; when do I get my elemental sort of powers? Like Blaze has fire, you have wind, and that earthy wolf had the plants moving around him- he even looked like a plant when he left." She trotted around from behind him, coming to sit in front. Her eyes were bright and attentive, and slowly the downy feathers on her back seemed more and more apparent. Her eyes moved to look about, she wondered what else would happen in the day. When would night fall here? In fact, was there a night here? Or did it remain day for all time? Actually, that was a silly thought. Even the young pup knew that. Of course, even in this strange wolf, there would be night. Her thoughts then wandered to an image presented in her mind. Mother. Where was she? Why had she left? 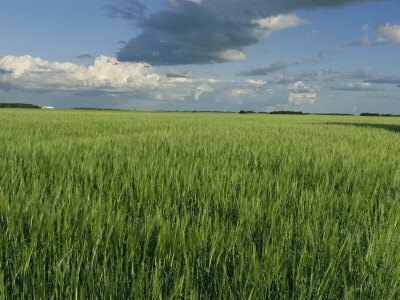 She gave a look out to the seemingly endless lines of fields, and far in the distance several different landscapes. But no forest in which her mother had lived. She frowned, and then laid down, her eyes gaining a sad look, but it would soon be wiped away again by the joy of a new world. The pups red eyes focused on the ground swaying his paws he noticed that his paws we'rent touching the earth, his eyes twitched oddly blinking his eyes he wondered what he was seeing was actually, gently he touched the ground softly only to look up and see a black wolf. ever would, inching back form the large male he sat down eyes brightening wit curiously. How'd they grow wings? Did it hurt? "Hello." Blood eyes shifted over to the female pup, she was just as strange as the other male, her pelt a light blue, but, he wasn't sure if he could see her wings just yet. His mind jumbled with words to greet the strangers, having never socialized with his own species, in a positive way. "Hey.." Crimzen spoke with a tad of uncertainty. His eyes watched them carefully, keeping his place under the rock he was pressed against. "I don't want to control winds. Then I'd be copying, and that would be silly if all Ales wolves had the same talents." And of all this, he could only move the currents. "Next question; when do I get my elemental sort of powers? Like Blaze has fire, you have wind, and that earthy wolf had the plants moving around him- he even looked like a plant when he left." "That's another thing that varies with every Ales. I can't even remember when I got mine. I only noticed it when my wing was broken in mid flight during a battle. It was the wind that slowed me. That's when I began to learn how to truely control it." He said, then looked at Aeria before glancing back to the new pup. "Well, then. Back to the main matters at hand. Who are you, young male?" Aquillo soared above once more and looked down to see a second pup. He grinned and made his way to the ground, landing differently this time, he soared in quickly, and allowed his paws to take the weight, as he ran along the ground, wings folding by his sides. Just as he did to hear Karatavuk speak to the youngling about her powers. "Of course, there are other things that an Ales can do. Create rain, lighting, twist the winds into tornados, heat and cold control.."
Quill laughed as he walked up to them, "Of Course not as great as I can control them. Merely make me angry and lightening will strike you down young one." He grinned as he stood to study to two younglings, both taking to the Aure WhiteLighter. It would seem to him that both would be Ales? The other clans would not appreciate it. "That's another thing that varies with every Ales. I can't even remember when I got mine. I only noticed it when my wing was broken in mid flight during a battle. It was the wind that slowed me. That's when I began to learn how to truely control it." The youngling watched him with wonder, her eyes bright, until movement in the skies caught her attention. She then saw the large nice wolf approaching once again. Where had he gone? Her eyes were filled with wonder as she eyed his wings too. They were nice. She wanted wings. "Of Course not as great as I can control them. Merely make me angry and lightening will strike you down young one." Aeria was confused by this statement. It was almost gloating, and she pinned her ears at it. But it only took a moment for her to calm down herself and look past that. After all, he was nice. "I like the idea of lightning." She stated blankly, sitting down. "He gave me a ride through the sky!" she said afterwards, gesturing to Karatavuk. "Oh! Oh! I have feathers!" She jumped to the side, proudly displaying the soft down at the top of her back. It would only be a bit before bones would likely begin to grow, though they would be soft and weak and need much tender care until they were strong. Even now she was beginning to grow thinner and leaner, for one of her mutations that would help her be very suited to the sky was hollow bones. She'd be light as a feather, not that she was not already. Karatavuk, upon hearing the pawsteps of a wolf behind him, turned to look at Aquillo. Almost immediatly he bowed his head in respect to the Divine. He smiled at his comment, and said in return, "He will, too." He looked to the pup as she spoke. She seemed to be very excited about the air and about flying. "We'll go up again later, as well." He promised before turneing to the Divine expectantly. "Sir Aquillo?" He asked, his tone hinting that he was curious as to what the Divine was doing. Coming to meet the new pups? He wondered. Subconciouly, his smaller wings spread, made a few flaps, and folded themselves up again to release the knot that had been forming in them. From the point where the streams disappeared underground to a black shape moving through the grass, a long, wet trail stretched. Erasmus's tail dragged behind him; He had long since stopped caring enough to lift it up. As he drew nearer to the scent he had caught earlier, his bright eyes spotted the contrasting pelts of Kartavuk, the White Lighter of the Aures, and Aquillo, one of the Charmed ones. Just before he fully reached the group, a high-pitched, excited voice reached his slate-colored ears. He stopped mid-step, paw still in the air. Not pups, not today. Briefly, Erasmus entertained the idea of turning and leaving right there, but he couldn't bring himself to move in any direction other than forward. Finally, he came to stand on the edge of the group, his lightning-like eyes dark and pensive. He didn't dare speak with the way his chest was aching at the sight of the young ones. Instead, he gave a respectful nod to each of them before sitting on his haunches, bringing his long tail to curl around his paws. The White Lighter's pelt still shimmered with the water of the stream he had taken to the Run-Through, though he could care less about appearances. He continued to stay silent as he observed the new arrivals, one of them already starting to sprout wings. The sound - and scent - of another wolf coming into the area stirred Karatavuk, causing him to look over at the Fluidus WhiteLighter. He nodded in respect to the hurting water-wolf, giving him a curtious smile. He knew all too well the pain the WhiteLighter must have gone through, though Karatavuk didn't know the story of what happened, nor did he ask. Instead, Karatavuk tried to silently support the year-younger male. He turned his attention to Aeria, and lowered his head to close the front of his jaw around one particular down feather. It had fallen off already, and he plucked it from Aeria's fur. He froze as he pulled his head up again. Her wing feathers are just like... He dropped the feather and shook his head, clearing his thoughts. Well, now, he thought, what to do about these pups... he looked again to Aquillo to await the Divine's words. "We'll go up again later, as well. "Obvious joy flickered across the youngsters face at the mention of such a thing. However, her expression disappeared when she saw a wolf of water approach. Her attention immediately fixed upon him. He seemed in pain.She frowned. She didn't want him to be in pain, it made her feel bad. Slowly, the young one began to approach him, her normal puppy attitudes turning down to a calm, almost adult attitude, but not quite. "Hello." She said quietly. Upon getting within a yard of him, she laid down, looking up to him with wonder. The clans seemed somewhat separated in a way, it confused her. She wanted to be friends with everyone, and she was willing to be calm or crazy to make sure they liked her. For now, she simply toned down on the spazz and worked on being calm and relaxed. As the female walked away from her beloved deserts, she watched the lush green grasslands open up before her. Trained eyes spotted those that she would be meeting with a bit of reluctance, and to hold it off longer, she looked back over her shoulder. It was a bad idea. There were patches of smoldering ash where she had stepped. Her heart sank as more death was caused by her unwilling self. Even if it was just grass, she felt guilty about it. A shudder ran through her body as she turned back to the task ahead of her. She could see where it was that she had walked earlier and sighed. What were the odds that any of the Terram wolves would ever let that slide? Slim, considering how much she was disliked. Without being given a chance she thought bitterly. As she arrived to the place where the youths were, she paused. "Who are they?" she asked casually. Blaze had no intention of wasting time. She had hunting to do. Erasmus found he could not return the fellow White Lighter's courteous smile, though he hoped his eyes would speak for him. He hadn't interacted much with the ebony Aure, yet knew he meant well. No one else besides Aquillo knew his story. They didn't understand the despair the Pisces felt every morning when he awoke without Penelope by his side, nor did they understand the utter misery he went through each night while his mind filled with images of his family. They never would comprehend it. This sorrow was not something he'd wish upon even his worst enemy. Somewhat startled from his musings, Erasmus tensed at the quiet voice merely a yard before him. He hadn't noticed the young pup edging closer to him. His chest clenched as he lowered his gaze to meet hers; the void within him only seemed to grow wider. The Fluidus leader did manage a small, crooked smile. "Hello, little one," he replied, his deep voice hoarse from both lack of use and melancholy. This pup was a curious one, he realized, taking in her sky blue fur that was still soft with youth. "What are you called?" His voice was smoother now, like the steady rumble of the ocean. Just as the inquiry slipped from his muzzle, the acrid scent of burning foliage reached his nose. Instinctively, the Fluidus stiffened. Blaze's temper had always reminded Erasmus of his black-hearted brother. He tensed further as the fiery she-wolf entered their little clearing, yet managed to hide his discomfort. Mentally, he berated himself for his reaction and turned his attention back to the curious pup before him. Karatavuk looked over at the fire wolf that had appeared before them as she spoke. "Hello, Blaze." He said. His tone was welcoming. It wasn't often that an Incendo came out of the desert. It made him happy to see Blaze in the clearing. "You've met Aeria. She is an Ales. The other..." He paused, looking around. Where was the other pup? He made a questioning glance at Divine, Aquillo. He looked back at Aeria and Erasmus, smiling a little at the fact the young one had started a conversation with the silent male. "Just like Silvai..." he murmerd under his breath. "Hello, little one, what are you called?" "I am Aeria..." The youngster said, though her gaze remained concerned at how unsettlingly sad the male seemed. Her blue eyes reflected the sadness, like the tops of a pond. It was now that she wished she was a water-puppy, maybe if she would be able to be around this wolf more time she could make him feel better? And Blaze, too. So many troubled wolves here. She wanted to help them all. "You're sad." She murmured. She inched closer, and headbutted his leg in an attempt to console the huge, sad wolf. Her turquoise eyes looked up to him again. "I'm sorry." 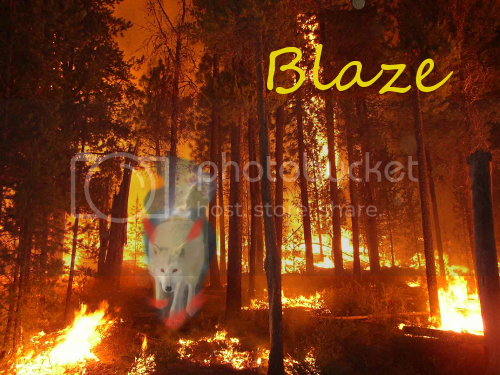 When she saw how she tensed as Blaze approached, she shook her head. "Blaze is sad too." She said in reply to his tenseness, hoping it would somehow help her. She didn't want any more mean stares at the fire-wolf. Kamea walked into the meadow where the new recruits would appear. Her brow furrowed wondering how the one of the pups had just disappeared without a trace. However immediately she spotted the other young pup. A blue tinge was already making it's way over her coat along with feathers starting to grow off her shoulders. She was sure to be a Ales. Apparently her name was Aeria. Moving over Karatavuk and Erasmus, she put on a smile. "So this is our new recruit?" 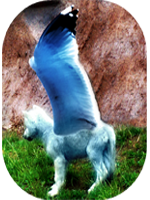 Kamea gave her wings a slight ruffle before looking down at the pup again, with a smile. "I see she shall be joining you, Karat. Take care of her then." "I am Aeria. You're sad... I'm sorry. Blaze is sad, too." Looking down into the pup's turquoise eyes was like looking into a mirror. In them, Erasmus saw all of his inner turmoil reflected back at him, mixed with the Aeria's own innocent concern. He had never seen anything like them before. When she gently bumped his leg, the wavering smile grew a bit. This young Aure seemed to peer right through his gruff exterior at the melancholy wolf below, and she actually wanted to help. "It is nothing for you to apologize for," he managed, his eyes traveling briefly to the other clan leader. In his mind, he knew his reaction to her presence was completely uncalled for and promised, for the pup, to work on it. Even if Blaze hid her own sadness behind her fierce temper, Erasmus could recognize a desperate soul. "So this is out new recruit? I see she shall be joining you, Karat, Take care of her then." The Pisces dipped his head to the second Divine as she entered the clearing. At her words, Erasmus was only slightly disappointed. He had long since become accustomed to being alone in the Great Blue Lake. However, this new pup intrigued him greatly. He made a second promise to visit the Canyon more often. The Ingnis wolf looked around as the others took interest in the new wolflings. The amount of relief that she felt when she found out that the new pups were not for her clan was describable in no words that she knew, and she had a rather big vocabulary. Thinking that none were watching, Blaze jumped in the air with a loud "Whoop!" When she landed, the loop of leaps and excited shouts continued on and on until the grass where she landed and jumped from had lit aflame and she was in the middle of the ring. Freezing, she stared at the wall and willed it away. That was no way for her to behave, and it was definitely going to make the others think less of her. Yeah, as if that is even possible she thought bitterly. In her ring of smoldering grass, she glowered at the others, daring them to say something. Karatavuk smiled at Kamea when she spoke, replying with, "Of course!" before he looked at Aeria, who seemed to have gained the liking of the water wolf. He smiled, obviously happy, until a wall of light hit his eyes. He turned to look at the deminishing source; Blaze. He laughed a bit at the ring, admiring the burned grasses. "That was cool. Would you do it again?" He asked, his head lowered to the ground as if he were looking for a spark. That was the odd thing about Karatavuk; he simply was awed by fire. Despite what happened so long ago, the unknown substance within fire intrigued him. "It is nothing for you to apologize for,"
"Maybe not." She mused, her eyes still watching him. As he smiled from the comfort she offered, her face broke out into a smile as well. "But I like it when you smile. It's nice when you look happy." Aeria jumped in the air with a yelp of surprise as a wave of heat washed over them like the tide, blowing several downy feathers into the wind. She twisted mid air, in an attempt to turn and land on her feet, but when she met the ground her legs gave out and she found herself sprawled and confused. Then she saw the ring of fire around Blaze. She was happy. She smiled. "Maybe not, but I like it when you smile. It's nice when you look happy." The water wolf was awed by the young pup before him. In a space of mere minutes, she had made him feel like the young soon-to-be father he had long since forgotten. He briefly wondered if this was what his own children would've been like, but those thoughts only made his chest clench tighter. Even after nearly a decade, that wound was still fresh and festering. 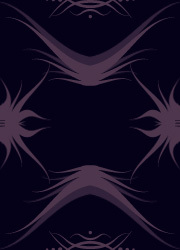 Erasmus had accepted years ago that the void within him would never completely heal, but now it seemed to be shrinking. "I'll be sure to do so more often, he found himself replying to his own surprise. He was certainly baffled by this Aeria. This was probably the greatest amount of words he had spoken in one day since he joined the Order. The Fluidus leader was a bit suprised as well by the sudden heat that swept over the area. His damp fur was suddenly warm and a bit uncomfortable, making him yearn to slip back into the cool waters of his home lake. He was definitely not one for fire. The pup was equally startled judging by her yelp and now sprawled form. He felt his lips quirk in an amused smirk. The sensation felt extremely odd; He was sure the muscles needed for that expression had atrophied long ago. "That was cool! Would you do it again?" The Ignisi female looked at the one who spoke. How dare he openly mock her! Balze frowned. Many had shied away. I could have let that spiral out of control she thought venomously. I could have let them perish. And yet, it was her own fault that the flames shad erupted in the first place. Blaze frowned at Karatavuk. The flying wolf should know too well that fire fed from air, and without air, there were no currents to keep him off the land. She was silent as her bright red gaze stared angrily at him. Breaking her gaze off was pleasant, though. She gazed at the others. "If things are done, I have hunting to be done." Karatavuk stared right back at Blaze. He didn't understand the anger she showed. "A small one?" He asked. His own eyes glinted with confusion. "Blaze?" He asked, curious as to her reaction. His wings stretched and flaped once, but not enough to lift him from the ground. He watched Blaze eagerly as he waited to see the substance of fire that wasn't coming from her paws or ears, though small wind spikes spiraled a few little flames into a dance around her paws. Kamea's gaze turned upon the Ignis. With a raised eyebrow she watched the female whirl around flames. It was interesting to see Blaze so happy. Apparently she really wasn't into pups. The grey female's eyes looked back to the pup in front of them all. Blaze's sudden flare up of fire had frightened the young pup. There would be a lot for the pup to get used to around the four clans, each with their unique traits. The Charmed one could have laughed at Blaze's reaction to Karatavuk's comment. So she restrained herself to a small smile and a slight wag of her tail. He's impressed Blaze, there's no need to be like that. she sent the thought to Blaze. "Blaze? Just a small one?" He's impressed Blaze, there's no need to be like that. The White Lighter flinched as the thoughts were projected into her head. No matter what, she would not ever get used to the feeling of another speaking into her head. Shaking it out, Blaze looked at Karatavuk. "It would be dangerous to play with what you do not understand," she grumbled. He may be fascinated with the flames, but sometimes, that fascination was often a dangerous thing. To have fire bend to your will was a task that took careful procedures. Her red gaze flicked to Kamea. Oh really? she thought, not knowing if that would work. The Incendo Clan leader wondered what having others to care for felt like. The last leader had died a long while ago, and since then, she had been alone. These other clans were growing, and hers dwindled at the single denominator of herself. No, she did not envy them for getting pups. How I detest those things she sneered to herself. If there was one to come across her, she wondered what would happen. Would they clash? With a sigh, Blaze sat. Something did not feel quite right, and by the looks of it, she was not the only one to pick up on the odd feeling. Karatavuk looked at his blackened paws as a rather unpleasent memory invaded the depths of his mind. He shook it out with a shudder from his body. I haven't had that memory come back to mind for years... he thought. Shaking it off, he looked at the fire wolf's paws. The small wind gusts spiraled the fire like vines around her legs. He watched in awe at the fire's tongues of light before a sensation overcame him, causing his wing feathers to fluff. What...what is this? He growled in thought, trying to shake the discomfort.